Since it's a bit cloudy today and cool, maybe an Italian sauce would be in order. This sauce is hearty, easy to make and really good for those autumn nights. I will often make this at least once a week, because it is quick and no drama after a long day at work. And...it is great the day after. If pork doesn’t work for you, this can easily be made with Italian turkey sausage as well. Serve it with rigatoni and lots of Parmesan and/or Romano cheese. 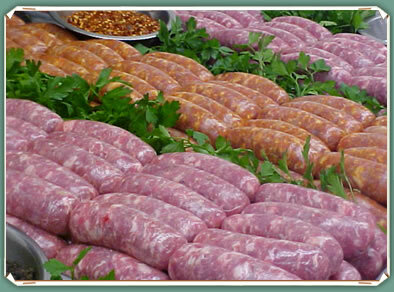 2 lbs of Italian Sausage links, hot or mild, cut into 1-inch pieces. 2 28oz cans of diced or crushed Tomatoes; San Marzano’s are best. 4 Tbsp Garlic, mashed and roughly chopped. Begin by browning of the sausage pieces in olive oil. Make sure they are cooked well, so the sauce will not be greasy. Then drain in a colander and set aside. While the sausage is browning, heat your cast iron or heavy gauge sauce pan and add the 3 Tbsp of olive oil and then add the garlic, onions, chili flakes, anchovy filets (if desired) and peppers. Cook until they are caramelized and soft. Add in your browned and drained sausage. Stir well and add the Marsala wine and cook until reduced slightly. Then add your tomatoes and nutmeg and simmer for 2-3 hours or as long as you like. Stir occasionally, to keep it from sticking, and add water if it becomes too thick. My Cookbook is finally done! Is this the world's hottest chili?